Microsoft’s Mission – Empower every person, every organisation on the planet to achieve more. On Friday 4th May, Wellingtone ran the first ever Project Management Day of Service (PMDOS) in London. Partnering with Project Management for Change, this is the first event of its kind to be brought to the UK. The first seminar of the day was from Emily Large at Microsoft who delivered a very inspiring and insightful presentation on their Tech4Good Charity Pathway and how Microsoft can help charities. Microsoft want to empower people with the skills, knowledge and opportunity to achieve no matter what their situation. Charities that are more digitally mature are 28% more likely to report an increase in funding than those who aren’t. 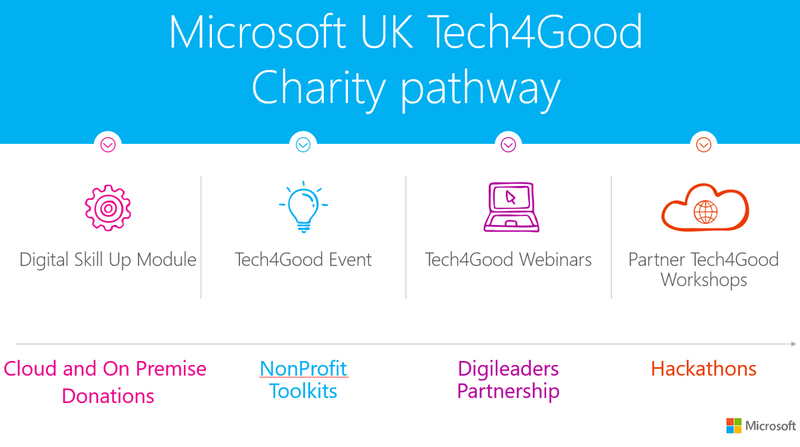 Did you know that part of the Microsoft UK Tech4Good Charity Pathway, they offer seminars, workshops and webinars to help up skill people digitally and also on software? They have a lot of learning tools and resources available and also a technology donation portfolio. You may also be eligible for discounted or free licenses on particular Microsoft products. You can find out more about what Microsoft offer to Charities, including where to go in the presentation below.